RIGHT ON THE BEACH AND ONLY STEPS TO THE SAND / NEW KITCHEN REMODEL! This 2 br/ba second floor condo beach retreat is located at the popular Kanai A Nalu complex in the quaint harbor village of Maalaea! This condo has beach access to the longest sugary golden beach on Maui that's suitable for all water activities and watching whales (during whale season). Beautiful newly remodeled kitchen featuring rich bamboo cabinets and an impressive granite counter top! New travertine floor tile installed through-out the main living area too! Enjoy a peaceful view of the breathtaking Maalaea Bay, and the sounds of the gently rolling waves. 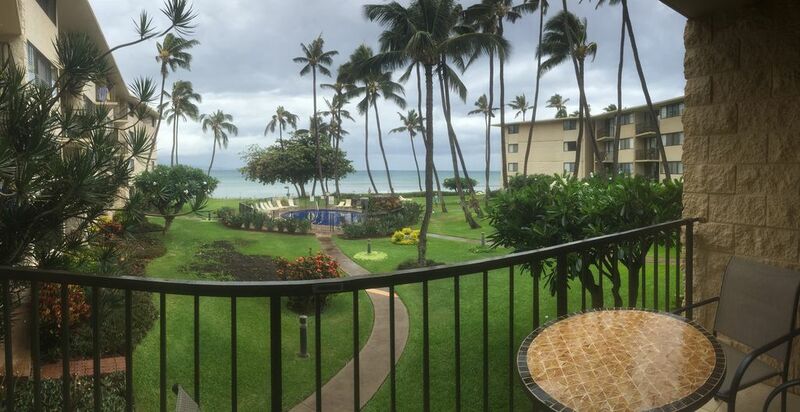 From your lanai you can relax and enjoy a moon lite cocktail or a morning sunrise breakfast! The complex features lush and tropical grounds and a beach that stretches for miles - stroll, jog or play in the surf! Have fun frolicking in the "beach side" heated pool, cook up a feast at the "beach side" BBQs and relax and get a great tan "beach side" on one of the comfy lawn lounges. Master suite has comfy queen with it's own master bath and tv. Bath also recently remodeled with nice tile walk in show. Guest room has two extra long twins that can be put together to make a comfy king. Guest bath updated too with a spacious walk in shower. Air-conditioning located in the living room and ceiling fans in every room to help keep you nice and cool. But who needs those when you have the cooling Tropical Trades to keep you comfy. Other available amenities for your convenience are free Wireless Internet, TV, DVD, cable, beach chairs, beach umbrella, beach towels and a cooler for your excursions and free parking. I Go Maui Vacation Rentals & Realty has been managing vacation rentals on Maui for over 16 years. We have a great reputation for meeting our "Motto" HAPPY GUESTS, HAPPY OWNERS, HAPPY US! DISCLAIMER: Please read the following payment/cancellation terms carefully as these terms in the Guest Agreement supersede any conflicting payment terms that may appear on VRBO, HOMEAWAY, or any other website. *Christmas/New Year block of dates balances due by October 1st. *NO CANCELLATIONS AFTER OCTOBER 1st FOR CHRISTMAS/NEW YEAR BLOCK OF DATES. PRIOR TO OCTOBER 1ST 100% REFUND. Booked after October 1st Christmas/New Year block of dates must be paid in full. *With In 60 Days No Refund *Rates & Policy are subject to change until reservation is confirmed. *SAVINGS FOR STAYS 28 NTS OR MORE FOR OFF SEASON DATES ONLY APRIL 15 - DEC 14. * Full mid-stay cleaning for 28 or more days stay is mandatory. Please call our office for cleaning rates and for scheduling. Fall in love with Kanai A' Nalu because of its location and that's not all! It is central to the island and just minutes away from anything you want, yet uniquely sited on a quiet, dead-end street in a small community. The condo gardens are immaculately maintained with beautiful flowers and trees. A short walk down the street is Maalaea Harbor, home to snorkel cruises, whale watching charters, fishing boats, and restaurants from casual to fine dining. The Maui Aquarium is right there too! Maalaea is also home to the Maui Ocean Center, filled with exotic reef fish, sea turtles, jelly fish, and sharks! We go to the Ocean Center every time we visit the island. Humpback whales migrate to Maalaea Bay in the winter (November through March) and we often watch them right from the lanai. Step out the door in the morning, walk barefoot on Maui's longest beach and watch the sun rise over Mt. Haleakala. Feel the sand between your toes as the ocean waves break gently on the beach. Watch the ocean for whales and sea turtles, or look just inland of the beach dunes for endangered Hawaiian stilts and other beautiful bird species on the Enjoy the longest sugary golden beach on Maui (lovely clean sand) Kealia Ponds National Wildlife Refuge is nearby for those who like to bird watch. Retreat to the lanai for a breakfast of locally grown papaya or mango and a cup of fresh Kona coffee. There is nothing else in the world so serene and relaxing. Please be sure to read the guest reviews to learn about guests happy experiences on the island and please add your own entry. Both bathrooms have been fully renovated, featuring tiled shower and floor, granite vanity tops, and recessed lighting. Bath #2 features a full-sized walk-in shower with hand shower, grab-bars, and shower seat. Smooth-top electric range, microwave, Keurig coffee brewer and dishwasher. Fully furnished for all your cooking needs. Be sure to look for the guest log, to read about others' experiences. Please add your entry prior to departure!